Mother rhino and her new-born baby. 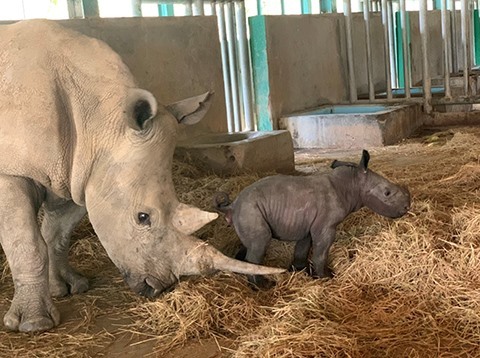 Vinpearl Safari Phú Quốc on April 3 welcomed the first baby rhino to be born here since the safari came into operation. This is one in two baby rhinos born in Việt Nam during the past decade. 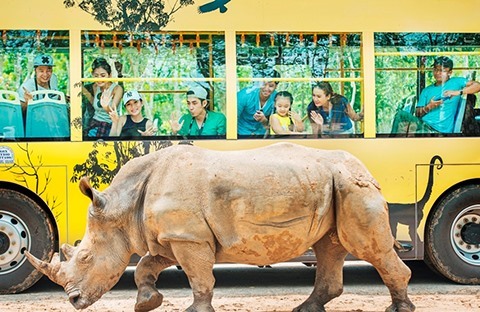 Reproduction of rare animals at Vinpearl Safari Phú Quốc in recent years demonstrates that the safari is an ideal environment not only for conservation but also for reproduction of rare and endangered wild animals of Việt Nam and of the world. The baby rhino is the first child of a White Rhinoceros couple. During the 16-month pregnancy time, the mother rhino and other rhinos in the herd lived in harmony under the considerate cares of the zoo’s staffs. In the natural living condition, White Rhinoceros could easily reproduce, every three to four years. However, at zoos, it was not easy for them to reproduce. 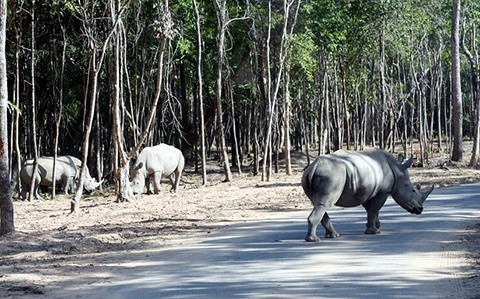 In Việt Nam, Vinpearl Safari Phú Quốc is one in few safaris with successful reproduction of White Rhinoceros. At the Southeast Asia’s largest safari, a herd of more than 20 rhinos lived in 16 hecrates of natural forest with the international-standard conditions. The living habitat of rhinos at Vinpearl Phú Quốc. Another rhino is expecting a baby at Vinpearl Safari Phú Quốc within this year. Vinpearl Safari Phú Quốc during the past three years became the place where hundreds of rare and endangered animals were born such as Belgan tiger, African lion, Bongo Antelope, Arabian oryx, yellow-cheeked gibbon and ring-tailed lemur. A rhino at Vinpearl Safari Phú Quốc. Vinpearl Safari is an evidence for that Việt Nam is fully capable of creating wild habitat and becoming a green home for the world wide-life animals. Vinpearl Safari Phú Quốc’s first phase with the area of 380 hectares was operational since the end of 2015. It is now a member of the South East Asian Zoos Association, Việt Nam Zoo Association and the International Species Information System. The safari has more than 3,000 animals of more than 150 types./.